Today brings us another classic from my holiday wish lists - slippers! 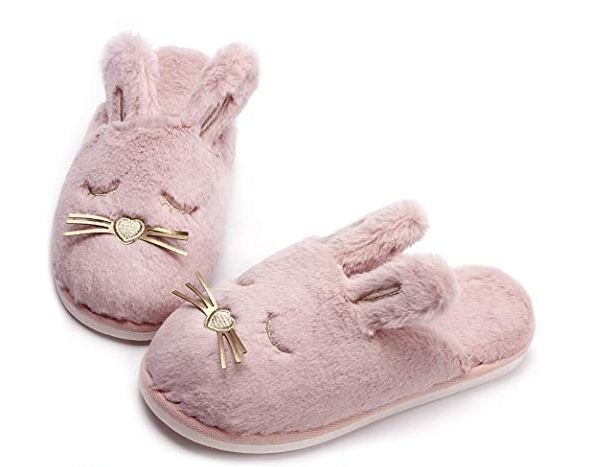 This year I'm hoping for some pink bunny slippers, with a no-slip bottom in size 8 - 9. For years, I was going through two pairs of slippers each year. I'd wear a pair til they wore through (usually sometime in the summer) and then switch to my second pair. It was a good arrangement. But those were more cute and less functional. Now that I get the plastic bottom, no-slip ones, I've been in the ones I'm wearing now for at least a year - maybe two? I can see where I'm starting to wear through from the inside now. That being said, I suppose I'd be okay with two cute pair, or one pair that's made to last. I wear slippers all the time, so I need some for sure!